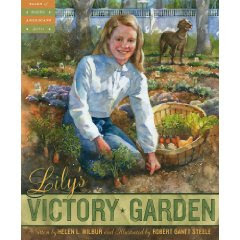 I was positively thrilled to see a copy of Lily's Victory Garden land in my mailbox. A new release from Sleeping Bear Press and it's about World War II!?!? What could go wrong? This is the story of Lily, a young girl who is very intent on doing her part to help the war effort. Her brother Jack and she collect tin cans and scrap but she would like to do more. She decides that she would like to plant her very own Victory Garden. The mayor in her town announced that they would be turning the town park into a large garden, separated into plots for various individuals to tend to and care for. Lily decides that is where she would like to grow her garden, but she is informed by the Garden Club President that she is too young to participate. Undaunted, Lily hones in on a neighborhood family with a yard available and requests permission to plant a garden on their property. Given permission, Lily sets to work but has the help of a secret friend. Who is the friend? And is the garden a successful venture? Well, I can't tell you everything about this book now, can I? Suffice it to say, I thought it was fabulously well done and helped explain the concept of Victory Gardens to young readers and lovers of history. I love that when you open it up, the endpapers are covered with artwork that looks like old seed packages - showing radish seeds for $0.15 and watermelon seeds for $0.45. I think it helps to create the proper introductory atmosphere for the book. I love the illustrations, done by Robert Gantt Steele, which bring history to life. I love Lily's determination to stand for what is right and do her part, even at a young age. I love that the book concludes with a page spread which talks a bit about what life was like on the home front during World War II. "Our president, Mr. Franklin D. Roosevelt, says on the radio that we are all one big fighting force, even the children. All these things we do that don't seem like much, well, they all add up. We are friends and neighbors and citizens and soldiers." I love that Sleeping Bear Press has brought to life such a title to help us remember our past history, to inspire us on in the future.